The flavor of this malt is as with pilsner malt with hue of peat and smoke. Varieties suitable for peat-curing process are used. Due to relatively low processing temperatures, enzymatic activities and other good brewing properties are maintained. Lightly Peated Malt can be used in distilleries in whisky production. In the brewing process, as Lightly Peated Malts flavor and taste profile is not too overwhelming it can be considered as pilsner malt with a special aroma. 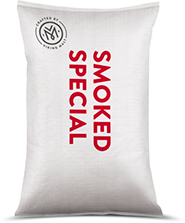 Lightly Peated Malt can be also used in bakeries as a spice. The flavor and taste profile is not too overwhelming, it can be considered as pilsner malt with a special aroma.